Awww, the hell with it. …until the end of March. I was in Minneapolis on a business trip, and every time I tried calling home I was connected directly to voice mail. Odd, but I thought perhaps the power was out or something. When I returned, I was informed that the phone service just wasn’t working. Restarting the ATA (the hardware adapter that converts the conversation into digital packets for transmission) didn’t do anything. It was dead, and it took my primary phone number with it. I tried working with support. Many e-mails were sent, and a few hours on hold later, it was obvious that I wasn’t making any progress. My favorite part was that almost every one of the e-mails I sent generated the same response from Lingo support: Please call for further troubleshooting. No we can’t replace the equipment until you call. Hey Lingo: How can I possibly call support when I can’t make phone calls on your device??? So, I’ve switched to Vonage. Picked up the equipment from Best Buy, which ends up being free after rebate, plus a $25 Best Buy gift card. Not a bad deal when you look at it. When making outgoing calls, Vonage spoofs my main number (I have a ‘virtual’ number that I can use until my primary number gets transferred over). The best part is that I can tell Lingo to forward my calls to the virtual number, so nobody even knows it’s going on. Dell should be introducing their new monitor, the 2405FPW, on or around March 1st. This bad boy is 24” with a widesreen aspect, has 4 USB ports and a 9-in-1 card reader, tons of inputs, and lots of other cool features. You have the option to do either Picture-in-picture of any two of the inputs, or you can split screen two inputs. I see one of these in my future, hopefully sooner rather than later. You know it’s time to sell a branch when it keeps getting robbed… even when the customers can’t go inside! A bank that has been robbed so many times it bans customers from coming inside was held up again anyway on Friday. Anyone using the Bank of America branch on Silver Hill Rd. has been forced to go to the drive-up or the ATM for the last few months, after managers got fed up with the repeated heists. But when one of the tellers went out for a break, a robber saw a window of opportunity. “There were two tellers inside of this bank. One of the tellers left to run over to the drug store and as she was walking back, a suspect wearing dark clothing produced a gun and forced her inside the bank,” Cpl. Diane Richardson of the Prince George’s County police. The suspect tried to lock both tellers in the vault, but could not. From this article in the Kansas City Star. It was one of the most unexpected things for me to see on my trip to Kansas City. 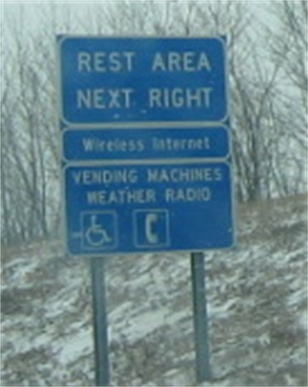 Iowa rest stops have wireless internet access available! The service is provided by I Spot Access, and apparently has been available since June 2004. Anybody who signs up for an account with the provider has the ability to surf free of charge for 30 minutes. Now that’s a good way to market your product. Well, that, and also the highway signs that are posted for all to see!